If you have a hypothyroid condition, your thyroid does not produce enough hormones for your body to function normally. The most common treatment for hypothryoidism is the medication levothyroxine, a synthetic hormone. Taking levothyroxine calls for certain eating practices. Your thyroid levels also can be affected by the foods you eat. Understanding how food affects your thyroid levels can help you devise a healthy breakfast meal plan for hypothroidism. If you think you have hypothyroidism, see your doctor for diagnosis and treatment. While the foods you eat might affect your thyroid hormone levels to a small degree, medication is almost always needed to supplement your body's low thyroid production. If left untreated, hypothyroidism can cause fatigue, slowed speech, weight gain, hair loss, dry skin and increased sensitivity to cold. The medication levothyroxine can reverse these symptoms by revving up your metabolism and energy levels. Most doctors recommend taking levothyroxine in the morning before breakfast. Levothyroxine will help jump-start your metabolism and give you energy for the day. Take levothyroxine on an empty stomach, 30 minutes to an hour before breakfast. Drink a full glass of water with the medication. Avoid drinking juice or consuming anything other than water with this drug, as food and drinks will dilute the effectiveness, making your body absorb less than the prescribed amount. People with hypothyroidism should follow a healthy diet, with a few considerations. Soy products can impede levothyroxine's effectiveness, notes Mayo Clinic endocrinologist Dr. Todd B. Nippoldt, so wait a few hours after taking the medication before consuming soy products. High-fiber foods and iron and calcium supplements also can hinder levothyroxine's effectiveness. Avoid consuming a large amount of soy and fiber, especially at breakfast. Ask your doctor for approval before taking iron or calcium supplements. If you have hypothryoidism, it is important to eat a nutritious diet that will not lead to weight gain or impede your thyroid function. 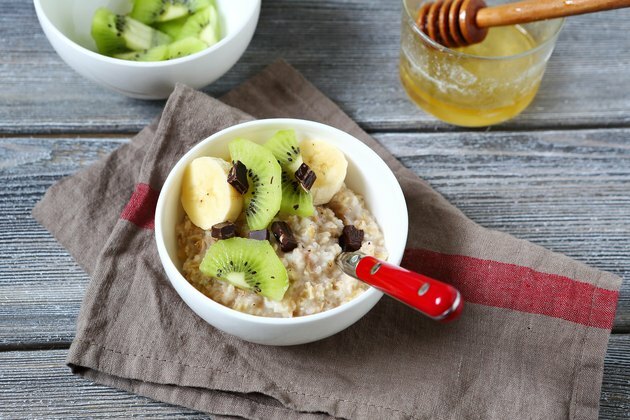 Aim for a breakfast that includes all the food groups: whole grains, meat or beans, vegetables, fruit and dairy. For grains, choose oatmeal, whole grain cereal, granola, whole wheat pancakes or a whole wheat tortilla. Make a breakfast burrito with scrambled egg whites and sauteed vegetables. Eat low-fat yogurt with fresh fruit for a side item. A whole wheat bagel with smoked salmon and low-fat cream cheese and a glass of fresh orange juice is another healthy breakfast option.